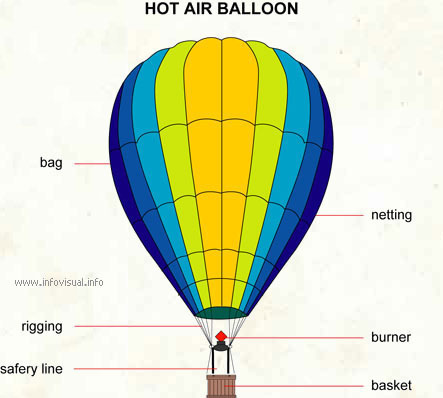 Hot air balloon - Visual Dictionary - Copyright © 2005-2016 - All rights reserved. [img]https://infovisual.info//storage/app/media/05/img_en/094 Hot air balloon.jpg[/img] [url=https://infovisual.info/en][/url] - [url=http://www.infovisual.info/]Visual Dictionary[/url] - Copyright © 2005-2016 - All rights reserved. Hot air balloon: balloon inflated with and lifted by hot air. Netting: cordage surrounding the envelope. Basket: pilot and passengers cabin. Safety line: cable used to open and close the valve. Rigging: cordage attaching the basket to the envelope net. Bag: balloon open at the bottom and filled whit hot air.